Ask fellow campers about "Outdoor Resort - Palm Springs" and nearby attractions. This essentially is a 5 Star Resort. Some lots are rented by the owner and there are some rented by the resort. During the winter season (Oct-April), it is difficult to find a spot, so book early. Facilities: Approx. 11 tennis courts, appx 16 pickleball courts, two large swimming pools and 6 satellite pools with laundry services, restroom/showers, etc. two large clubhouses, 27 hole golf course (executive). Beautifully maintained grounds, lots of greenery. Delightful place. We camped at Outdoor Resort - Palm Springs in a Motorhome. Wonderful resort. 8 heated swimming pools, 2 clubhouses, spa, fitness center, 26 holes of golf, tennis, pickle ball, even an on site Italian restaurant, all within 10 minutes of downtown Palm Springs. Clean quite, beautiful. All back in sites. This is a private ownership park, so you need to go through owners themselves or booking company (we used booking company). My only complaint is no WIFI or Cable since these are individual lots. We used our satellite dish so no issue on TV, but the WIFI was a pain but available free at the 2 clubhouses. We will definitely be back. We camped at Outdoor Resort - Palm Springs in a Motorhome. Lots and lots to do in Palm Springs, Coachella Valley, this place deserves at least a week, a month would be much better. If you absolutely love the sound of lawn mowers, this place is for you. It's beautiful but it sure isn't quiet! Great for golfing, not for sleeping! We camped at Outdoor Resort - Palm Springs in a Travel Trailer. Sites are level and large. Beautiful landscape, pools, grounds. But the place is NOT dog friendly. They call 4 10x10 fenced areas with AstroTurf that stinks like strong urine a "dog area". Nasty and Inadequate to say the least. Feral cats are around the dog area in the evening for your enjoyment (Lord knows what parasites reside). Many signs everywhere to remind you that your dog is barely tolerated... "this is not a dog run" on all grassy areas. Supposedly a better dog park is coming in the future. Hope so. We'll see. There is another small dog area up by the entrance with natural grass that doesn't stink, but you have to exit the park and then re enter through the security gate. Kind of scary at night, and it's not fenced. We camped at Outdoor Resort - Palm Springs in a Fifth Wheel. Stayed in our 13' Happier Camper amongst the massive high end motor homes. We were near the El Saguaro Clubhouse, in a site that backs up to the 9th hole of one of the golf courses. This is a very nice park. Lots of Snow Birds from Canada who typically are very friendly. Across the park road from us was a large lap pool, two spas that were probably about 15' square each, a large meeting hall with a bar that was open weekday evenings, an espresso bar, and a hair dresser. Down the park road was the main clubhouse which included a nice restaurant. The site was hard scraped with a short brick wall, and a view out onto the fairway water hazard. The rate included $69 for the site plus $10 for the HOA fee. On top of that was 12% tax. 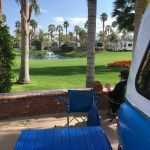 We camped at Outdoor Resort - Palm Springs in a Travel Trailer. Check out the park layout to make sure the site you rent is not within range of golfers hooking or slicing. Some sites appeared to have protective screens to reduce damage from errant golf balls. This would affect your view onto the course. Park may establish a minimum length for short term renters. There was none when we rented. I would confirm both with the rental agent as well as the park management if you are arriving with a shorter trailer. No problems with ours this trip. We rented (sight unseen) a fifth wheel for Feb 2017. If you choose to do that be careful!! The park is wonderful with pools, golf, club houses, various activities daily. It is not a dog friendly park with the approved areas either outside the gate or some small fenced area of astro turf that smells like a sewer. We were told horror stories of owners yelling at people walking their dogs in the middle of the streets. The unit we rented was old, dirty and stinky. It had leaked and the ceiling was decayed and with black streaks that looked like mold. The sink had also leaked and was very smelly. It was pointed out to us on our last day that the roof was repaired with a blue tarp and rocks. We complained to our rental agent about all the problems and never received any real satisfaction. We toughed it our rather than lose our $2652.00. Other than the grounds and amenities it was a very unpleasant experience. We camped at Outdoor Resort - Palm Springs in a Fifth Wheel. OK, this is definitely the best and nicest park in the Palm Springs area. It is not cheap, but you get what you pay for. It is a real resort. But ONE MAJOR ISSUE: it is totally not dog friendly. A small and totally inadequate dog park, which is not centrally located, makes walking your dog a major pain. So, if you have a dog (we do), skip this place. 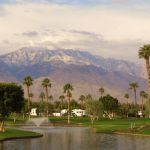 We camped at Outdoor Resort - Palm Springs in a Fifth Wheel. Close to all most everything... good location. We love this place! It is a little pricey, but it's like staying at a 5 star resort. There are 2 large club houses and pool areas, as well as about 6 other smaller pool areas. There are many tennis and pickle ball courts. There is an 18 and 9 hole golf course that are very well kept. The sites are privately owned, but are available to rent. Many of the sites have beautiful upgrades, tables, chairs BBQs etc. They recently started charging a $10.00 per day resort fee, but that includes the golf so if you golf everyday that more than makes up for the fee. We were on a golf course site which is more expensive. We camped at Outdoor Resort - Palm Springs in a Motorhome. Very nice area to visit! Thursday nights there is a street fair in downtown Palm Springs, Sunny Lands, the Annenberg estate, is a great place to visit. We reserved and were assigned a site ahead of time. When we got to the site it was filthy and much of the lighting did not work. I complained to the office, but during our three day stay no one showed up to clean or fix items in need of repair. I will not stay here again. We camped at Outdoor Resort - Palm Springs in a Motorhome. The only downside is that there are no pull-thus. The park is large and if you are planning just an overnight stay this is not the place. We always stay on the main golf course and it is beautiful. The people are friendly and the grounds are beautiful. We will return. We camped at Outdoor Resort - Palm Springs in a Motorhome. One of the nicest places we've stayed. The sites are owned by individuals and leased back through an agent. Sites are concrete an have neatly trimmed grass. Our site was across from the par 3 golf course and was beautiful. The roads are all paved and the facilities, pools, restrooms, laundry,etc were immaculate. The small fenced dog runs were adequate at best. We camped at Outdoor Resort - Palm Springs in a Motorhome. Easy access near Ramone Road. Country Club setting. Easy access to all of the Cochella Valley. We plan to return in the Fall. We've stayed here a few times and keep coming back. Best value is for longer-stays of a month or more. The "official" rental agency (through ORPS) prefers to rent by the month; private renters may have different policies. You can rent for less time, but they won't reserve for that until the first of the month that you want to rent in. It's a bit cumbersome, but understandable. Seems like there are almost always rentals available, though, so you could just drive up to the door and would have a reasonable chance of getting a spot for short-term. The facilities are really great, as noted in other reviews, and owner-residents seem to be making a big effort to be friendly and inclusive (unlike in the past). It's a beautiful resort. We'd come back for sure. We camped at Outdoor Resort - Palm Springs in a Motorhome. You could spend all your time in the resort, but we highly recommend you take the time to get out and see all the Coachella Valley has to offer. We camped at Outdoor Resort - Palm Springs in a Motorhome. We have been staying here since it opened. It is so nice here. Nice pads long with grass around RV with nice grounds everywhere. We are now staying a month every Feb. and the price is for a monthly stay including utilities. However the park charges $4.00 a day for usage fee on top of monthly contract. They have 8 swimming pools 9 Jacuzzi spas 2 par 3 golf courses numerous tennis courts and many other beautiful amenities. This is one of the nicest parks we have ever stayed in. We camped at Outdoor Resort - Palm Springs in a Motorhome. This is an exceptional resort, we had a beautiful site on the 14th tee box, with a mountain and lake view. The sites are large and are individual owned. So location and site improvement would make a difference in your experience at this resort. The people where very friendly and went out of there way to say hi. We have stayed here a number of times and this was out best experience. Because there are no pull-thurs and the park is so large best to spend at least 3 nights it is not good for overnighters. We camped at Outdoor Resort - Palm Springs in a Motorhome. 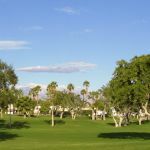 Lots of things to do in the Palm Springs area, 125 full size golf courses. Sites near Ramon Road get a lot of road noise during the day, try for a site further to the south. 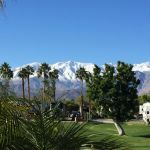 Are you affiliated with Outdoor Resort - Palm Springs ?